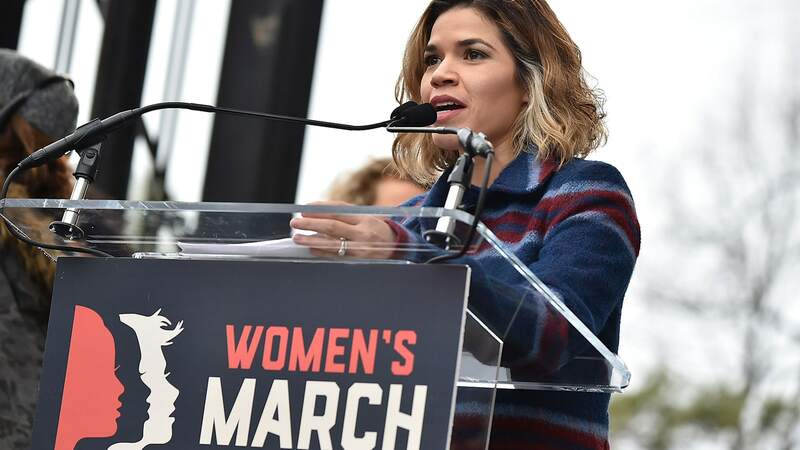 The 2016 presidential election didn't end exactly the way America Ferrera had hoped—but it did spark the beginning of a new chapter in the actress's mission to advocate for equality. "As a woman, as a Latina, as the daughter of immigrants, as an American, [the 2016 election] did feel like, in a lot of ways, a death," Ferrera tells MAKERS in a candid new interview. "A death of an idea that I had built my American identity around." "[The President] announced his candidacy by calling Mexicans rapists and murderers. When I heard that, I thought for sure that he could never last—that this country wouldn't stand for that. And nothing happened. He gained support," the actress and activist recalls. "When he talked about attacking women, I thought, this country won't stand for that, and yet, it did. When he talked about banning Muslims, I thought, this country won't stand for that. I truly, truly, truly believed that that wasn't the identity of this country." But rather than "sit on the sidelines," Ferrera decided it was time to step up and speak out. "When I realized that for so many people, they had been living in the reality of this ugly picture of America that we were all so ashamed to see, that made me realize that there was work to do," says Ferrera. "We couldn't sit on the sidelines and cry and feel sad, while there were people who had been working for decades and for generations to address these issues." So following the election, the Superstore star and producer took her activism to the next level. She formed Harness alongside her husband Ryan Piers Williams and actor Wilmer Valderrama to unite grassroots leaders and influencers in entertainment, business, and tech in an effort to create change in underrepresented communities. At the inaugural Women's March on Washington in 2017, Ferrera delivered one of the keynote speeches, telling more than 500,000 people gathered "[The president] would like us to forget the words 'Give me your tired, your poor, your huddled masses yearning to breathe free' and instead take up a credo of hate, fear, and suspicion of one another.... We refuse!" And in the wake of the #MeToo movement, Ferrera became one of the founding members of Time's Up joining MAKERS such as Michelle Kydd Lee, Tina Tchen, Jill Soloway, and Ava DuVernay to address systemic inequality and injustice in the workplace. "I think about how lucky I am that the opportunities I have, have come to me—and also how much work there is to do so that it gets better for the next generation," she says. For more about Ferrera's incredible rise in Hollywood—and how she is fighting to lift up other women along the way—watch her story now.